Fiocchi has partnered with TULAMMO to bring this ammunition into the United States. Note: this is 100% produced and sourced in Italy, by Fiocchi, a manufacturer with an excellent reputation for delivering consistent ammunition at a high level of quality. The Brass FMJ and the brass cartridge casing make this a bit less expensive to produce without any adverse effects on your firearm. A 230 grain .45 ACP offering is the classic ball ammunition profile and load. It’s something that Fiocchi has been producing for more than 50 years, and the quality is fantastic for target/range ammunition. 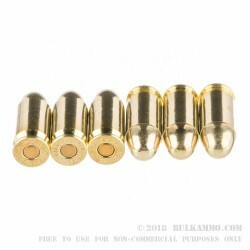 Because brass components are cheaper to produce (less money than copper jackets), this ammunition represents one of the best values on the market for mainstream calibers and you can guarantee that Fiocchi produced it, with machinery that has produced hundreds of millions of rounds for use around the world by police, military and sport shooters. 860 feet per second out of the muzzle and 375 ft. lbs. of torque, this is a round for the range and plinking, with a price point to match. 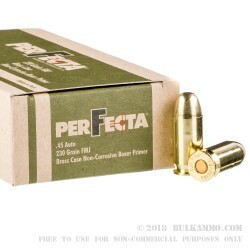 It’s not a first choice self defense ammo, but should be reliable and consistent in almost any sports shooting situation. 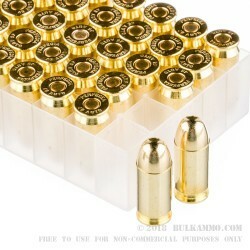 This is 20 boxes of 50 rounds in a caseload of 1000.
Review by BFE USA. SLR M.D. Q: will this pass a magnet test at my range? A: Hello Jessica, This ammunition is loaded with a standard lead core, copper jacketed projectile and will have no issues passing a magnet test. 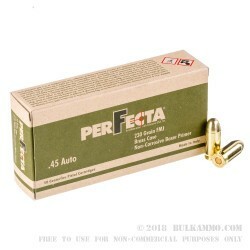 Q: Does this ammo have normal or small primers? Thanks. A: According to Fiocchi's website, these are loaded with small pistol primers.